I was asked to add this to the EOF fourm section so that EOF devs can have a read and see if this can be added into the software or atleast explain it for anyone else to do this double stop bedn with different values. I wanted to add a double stop bend to my CDLC Rock n Roll Star by Oasis this bend is in the chorus of the song and requires the strings to bend at different values as show. To get the desired effect i tried many things but could get the result I wanted so I turned to CF's discord for help, lucky two clever users I)ark_Seph and Firekorn where there to help me out. So in EOF you need to find the bend you want to do this on you need to highlight the bend and go to Edit Guitar Pro Note (n key), here you split all the notes that are highlighted. Next you need to save the song and find the tracks .xml file then open it in notepad or notepad++ to make it easier. Using the timing form EOF locate the bend code in the file. Then edit the desired string e.g string 3 to a full bend instead of a half bend do it to all the code that needs it to be done and save the file. Then you can compile the song in RStoolkit and test it out on RS. Sadly if you need to edit any of your chart in EOF you will have to do all above again as EOF overwrites the changes. Hope this helps users and hopefully the devs can add into EOF with a future patch. I think you should already be able to define this in EOF by using tech notes. You'd have to place the tech notes at least one ms apart so that you could define a different bend strength for each string, but otherwise it should do the trick. @raynebc Except that a pre-bend value must be on the note head so in this specific case where it's a chord, you can't put different value at the exact same time which is required for the pre-bend. @raynebc think thats what i tried first but no joy. 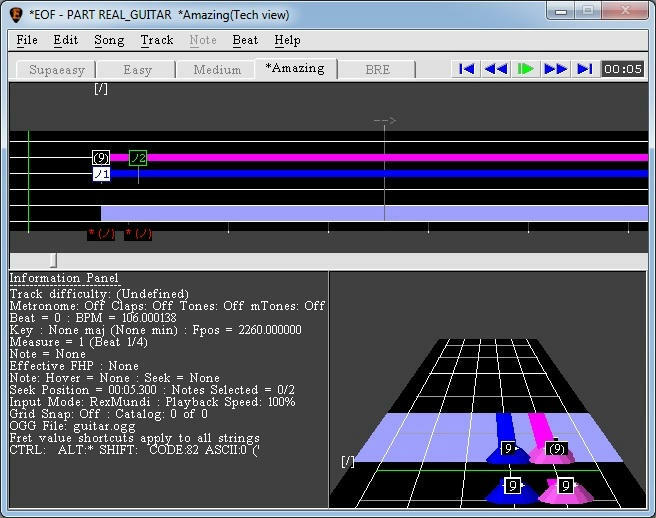 To make it easier to place the technote on either note if it is not grid snapped, you can place the tech note just after it and while that tech note is selected, use the "Note>Rocksmith>Move t.n. to prev note" function. Then just apply the appropriate bend strength to each of the tech notes. Would anybody else end up making use of a pre-bend tech note status? Well i might use it even if the song that would require it are probably rare but i at least see how it can solve some situation. By now, a pre-bend tech note status is available to author this.